Learn to do it right. This grill basket from SurLaTable.com makes flipping faster. Bobby Flay is one of food TV’s favorite chefs: In Throwdown, Grill It! and Iron Chef America. But he’s also a home griller, like the rest of us. Here are Bobby’s tips for doing it The Flay Way. Also check out Bobby’s delicious Ribeye & Anaheim Chile Quesadilla recipe. Charcoal or gas? Both give excellent results, so choose the one that best suits your style of cooking. Don’t underestimate the importance of having enough room to work. Grilling is much more relaxing when you are not trying to juggle a whole collection of plates and bowls as you do it. If your grill doesn’t have enough workspace—and they almost never do—set up a table next to the grill. Organize your tasks: Plan a menu, make lists, do the shopping. 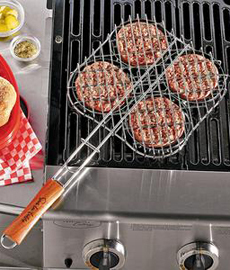 When it’s time to hit the grill, get everything out in front of you: food, spices and tools. Everything you are going to need should be within easy reach. 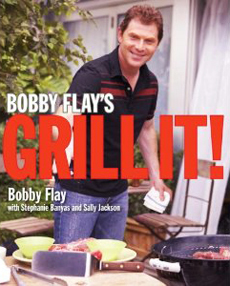 Learn more about grilling with Bobby Flay’s Grill It! Most of the time, Bobby grills over high heat: he likes the sound and smell of a very hot fire. Gravitate toward dishes that you can get on and off the grill as quickly as possible. After a while, you’ll know without thinking about it how hot the fire is: high, medium-high, etc. Until then, you can use the time-tested method of holding your hand 4 inches above the grate and seeing how long you can keep it there. It may sound a little dangerous, but you’ll pull your hand back at just the right moment. This includes thick cuts and foods with bones, such as ribs, whole chicken and bone-in chicken breasts. 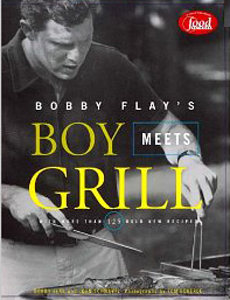 There are 125+ recipes and tips in Bobby Flay’s Boy Meets Grill. The more you touch the food on the grill, the more it will stick and begin to fall apart. Brush your burgers, fish or vegetables with oil and season with salt and pepper; then place on a hot grill. Don’t touch it for at least 2 minutes! It needs to form a crust so that it can naturally pull away from the grill. If you begin to turn it before the crust has formed, it will stick. This will only press out flavorful juices and cause flare-ups. Flip the food only once, if possible. You can always put food back on the fire if you need to. 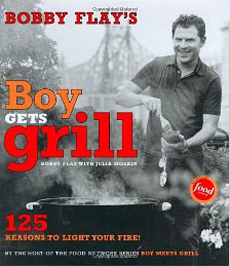 There are 125 reasons to light your fire in Bobby Flay’s Boy Gets Grill. Lifestyle Direct, Inc. All rights reserved. Photos are copyright of their respective owners.